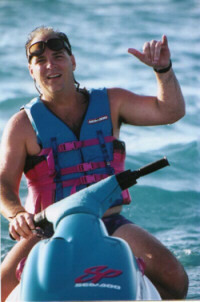 I started jetskiing the summer of "94". 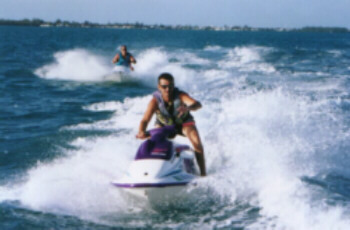 A buddy of mine Keith, purchased a 1994 Seadoo spi and invited me to go along on its maiden voyage. Well that's all it took, I was hooked. 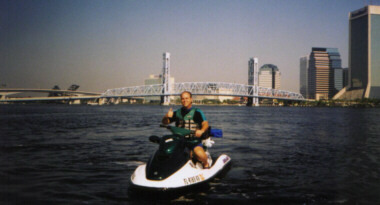 About two weeks later I purchased my first jetski, a 1994 SP. I thought that ski would cover my needs, but by the end of summer I was wishing I had bought a faster ski. Let me give you a word of advice, if your planning on buying a jetski, spend as much as you can, it will save you from trading it in later for a bigger/faster ski. 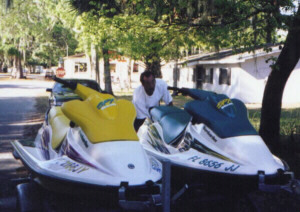 I bought my second ski, a 1997 Seadoo SPX at the beginning of 97. Man, that was one fun ski (59 mph top speed). Well about a year later Sabrina and I got married, the SPX was still a fun ski but when we rode together we found it to be really unstable at low speeds, this took some of the fun out of riding together since it was a chore to keep it balanced soooooo, once again time to make a trip to the Seadoo dealer. So in Feb. of 98 we purchased a 1997 Seadoo GTX. This ski is incredible, still fast (54mph), with all the bells and whistles. Being a three seater its very stable and comfortable, and surprisingly responsive. Well enough of my story....Check out the pictures ! 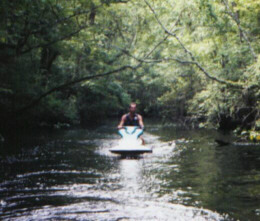 This is my bud Dave riding in one of our favorite spots "Julington Creek". Lots of gators here. This picture was taken during a trip to the keys the summer of 95. If you like jetskiing this is the ultimate riding spot. That's my other bud Keith in front, I'm in the background. Here I am during a jetski/camping trip that Dave and I went on.We headed out on a Saturday morning and returned Sunday afternoon. It was a 90 mile round trip. My bud Dave goes into more detail along with pictures on his web page. If you want to check his page out click here. Another picture taken during my first trip to the Florida Keys. It was a great trip, made new friends and partied for seven days straight, sun up to sun down. Dave unhooking the skis, getting ready for a trip to Silver Glenn Springs which is a major PARTY spot 95 nautical miles south of Jacksonville. My ski is the yellow SPX.